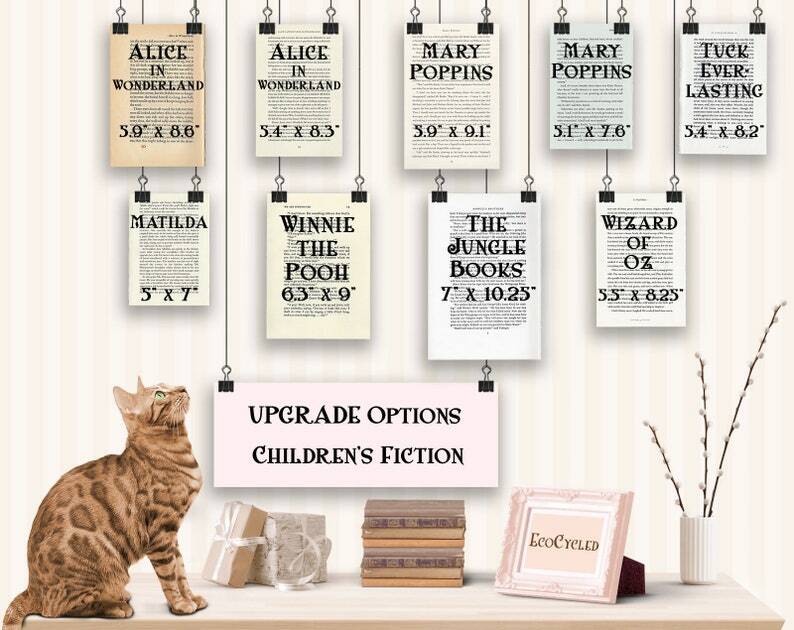 Select a material AliceWndrlnd5.9x8.6" AliceWndrlnd5.4x8.3" WinniePooh 6.3"x9" MaryPoppins5.9x9.1" MaryPoppins5.1x7.6" Matilda 5"x7" WizardOz 5.5x8.25" TuckEvrlstng5.4x8.2" JungleBook7x10.25"
Remember, this is an UPGRADE. You need to have the design you'd like printed over the book page in your cart at the same time. This is an UPGRADE to a page of a children's book. You need the design you'd like printed over this page in your cart at the same time. Upgrade any EcoCycled Book Lover design to be printed over a Children's Book Page instead of a dictionary. A great literary gift for a classic nursery, book nook, or anyone young at heart. We rescue old books and rejuvenate them as clever and unique art just for you. Our book art prints are as smart and unique as you are. This is an UPGRADE. You need to add it to your cart with the design listing that you'd like. If you are ordering more than one design, please include a Note to EcoCycled in the text box when you check out with which goes with what.